Hinduism is a religion that comes from the Indian subcontinent. This religion is thought to have appeared between 3102 BC and 1300 BC and is the oldest religion in the world that still survives today. This religion is the third largest religion in the world after Christianity and Islam with a population of almost 1 billion people. Hindus are predominantly in the Indian subcontinent. Here there are about 90% of the followers of this religion. 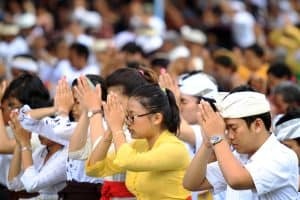 Today, the majority of Hindus in Indonesia are Balinese, but also spread across the island of Java, Lombok, Kalimantan (Kaharingan Dayak tribe), Sulawesi (Toraja and Bugis – Sidrap). For more information, you could see the history of Hindu religion in Indonesia below. Hinduism was spread in Indonesia sometime in the 15th century BC. the ancestors of the Indonesian nation entered Indonesia from the mainland of South China, passing through three directions, the northern passage through Japan, Taiwan, the Philippines, and spread in Sulawesi (Indonesia), the eastern passes, Irian and Melanisia, and from the west through China, Malaysia then spread in Sumatra, Java and Kalimantan. The influence of Hinduism from India to Indonesia was brought by Indian merchants with a large fleet. After reaching the island of Java (Indonesia) they established a colony and built cities as a place to advance his business. From this place they often make contact with India. This long lasting contact, then the spread of Hinduism in Indonesia. The entry of Hinduism into Indonesia occurred in early AD. This can be known by the existence of written evidence or ancient objects in the 4th century AD with the discovery of seven Yupa relics of Kutai kingdom in East Kalimantan. Of the seven Yupa it was found information about religious life at that time which stated that: “Yupa was established to commemorate and execute yadnya by Mulawarman”. Another statement says that the king Mulawarman did yadnya in a holy place to worship the god Shiva. The place is called “Vaprakeswara”. The entry of Hinduism into Indonesia led to great renewal, such as the end of prehistoric Indonesia, the transformation of the ancient religion into religious life that worships the Supreme God with the Vedic scriptures and also the emergence of the kingdom governing the life of a region. Then in 929-947 appeared Mpu Sendok from Isana Wamsa dynasty and titled Sri Isanottunggadewa, which means a highly venerated king and a devotee of Lord Shiva. Then in lieu of Mpu Sindok is Dharma Wangsa. Next, Airlangga (who ruled the kingdom of Sumedang in 1019-1042) came as one who was so faithful to Hindu. After the dynasty Isana Wamsa, in East Java emerged Kediri kingdom (year 1042-1222), as the carrier of Hinduism. In this period of the kingdom there are many works of Hindu literature, such as the Book of Smaradahana, Book of Bharatayudha, Book of Lubdhaka, Wrtasancaya and Kresnayana. Then the kingdom of Singosari was established (1222-1292). At the time of the kingdom of Singosari, there were found Kidal, Jago, and Singosari temple as a relic of longing in the royal era of Singosari. After the Waturenggong Period in Bali, the development of Hindu religion in Bali did not seem to change significantly. Especially after the government of Sri Aji Dewa Agung Gede (1825-1870) is very weak, which gives the opportunity some local courtiers to break away and form small kingdoms. The arrival of the Dutch to Indonesia, especially to Bali, also complicated the social system, so that the Wangsa became stronger into Balinese caste. In 1939 exactly in Klungkung, there stood a religious organization called Tri Murti, while in Singaraja stands the Association of Bali Dharma Laksana. These organizations aim to improve the implementation of religion through the publication of books, to improve the quality of the people. In the Japanese era founded Paruman Pandita Dharma which aims to unite the various religious understandings contained in Bali. At that time the religion adopted by the people of Bali is the religion of Shiva Raditya or the religion of Sang Hyang Surya (in accordance with the worshiped god of Japanese society). The development of Hindu religion to Bali is estimated before the 8th to 10th century. This is evidenced by the discovery of Ye Te Buddhist dimension which mentions Siva Sidarrhartha in Pejeng. More on the next development of this Siva Buddha, Siva is more prominent. Wrongness is more clearly contained in the inscription Sukawana A. 1 and rontal Bhuvana Tattva Maharesi Markandeya which tells up to the establishment of Pura Besakih using the basic Panca Dhatu. The development of Hindu Religion in Bali took place from the time of Ancient Bali to the present experiencing austerity. In the early Balinese period, it was preceded by the reign of the king between Dharmodayana Varmadeva and Gunapriya Dharmapatni (son of Mpu Sendok) from East Java, united and reached its peak. At that time also to Bali dating Mpu Kuturan, assigned to organize religious life, uphold dharma and sisti societies, to Bali to be safe and orderly. The development of Hinduism in the mid-Balinese period until the New Bali period preceded the fall of the ancient Balinese kingdom, resulting in a leadership vacuum in Bali, then formed the highest assembly of Hindus named Parisada Dharma Hindu Bali. The development of Hinduism in the mid-Balinese period begins with the government of Krsna Kepakisan beristana in Samprangan. Then it was replaced by Dalem Waturenggong reach the peak of the golden, because the appointment of a palace priest named Dang Hyang Nirartha, many services in the development of Hinduism in Bali. Those are the long explanation for history of Hindu religion in Indonesia. Up to now Hindu religion becomes the most embraced in Bali. This is Indonesia with all of the various diversities.